Gyuvech: It’s not only the container… it’s what’s inside. 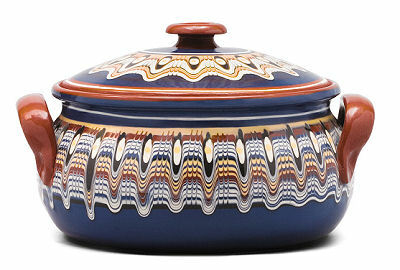 One-paragraph history and etymology lesson rolled into one: In Bulgaria (and throughout the Balkans), meat and vegetable casseroles are often made in beautifully decorated earthenware pots known by a staggering variety of names, including guvech, gyuvech, đuveč, ѓувеч, гювеч, ђувеч, and others. The word has become not only synonymous, but indeed coterminous, with the meal prepared within it. [In that sense, it’s kind of the opposite of the word restaurant, which, back in the mid-18th century, was the name of a bouillon, later morphing into its modern definition of where that bouillon is served (when bouillon is served there at all, rarely the case these days).] By the time the word reached Turkey, it had become güveç, which more or less transliterates into guvech or guvetch, which is how we know it in North America. Just like my great-grandma didn’t used to make. But someone else’s did. 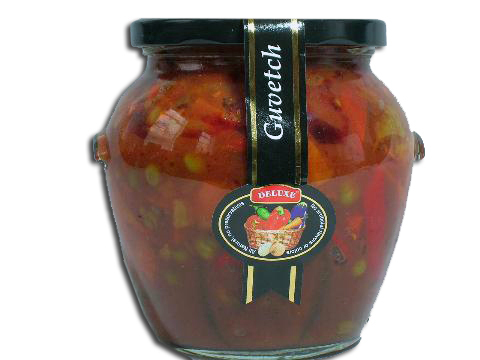 As with any casserole/stew/hotchpotch, there are something approaching an infinite number of recipes for guvetch, but I’m quite fond of this meatless commercial variety, produced in Bulgaria by Konex Foods and marketed In America by Indo-European Foods under the label ZerGüt. It may be my favourite guvetch because it’s the only kind I’ve ever had (which is true), but it’s quite delicious on its own terms. According to a spokesperson for Konex, the commercial recipe is derived from one handed down by one of the company founder’s ancestors. The vegetarian guvetch they market (pictured above) is a simple mélange of aubergines, peppers, potatoes, carrots, water, sunflower oil, green beans, tomato paste, peas, salt, okra, onion, sugar, and parsley, with no preservatives, artificial flavours, or colours. At 250 calories per 19 oz. bottle, it’s easy on the diet, too. Flash forward to earlier this evening. I’d had a hankering for shepherd’s pie, but there wasn’t any ground lamb to hand, and I decided to take a whack at a vegan version. Set a pot of salted water on to boil. 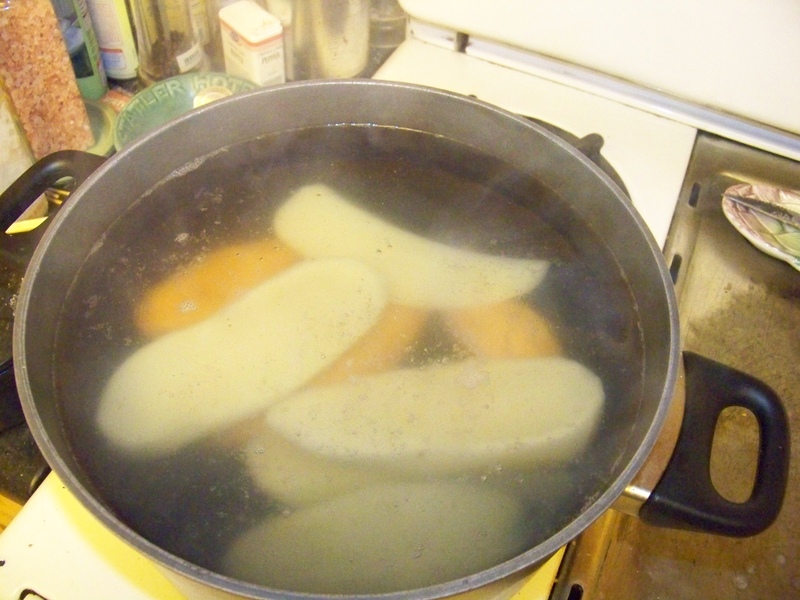 Peel potatoes and yams; cook in boiling water for about 20 minutes, or until soft. Drain. 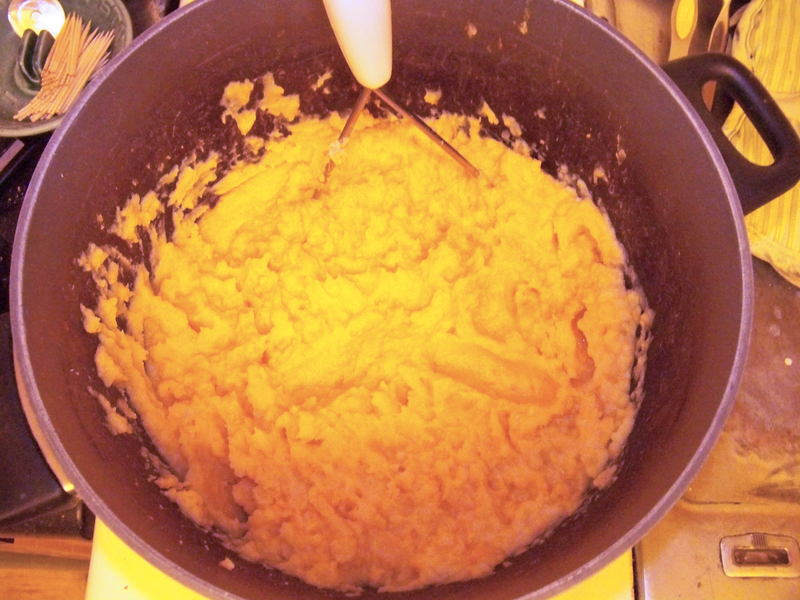 Return to pot and mash with almond milk and salt; set aside to cool slightly. Divide guvetch evenly into six ramekins. Microwave on high for about 2 minutes to warm. Here’s where I got silly. 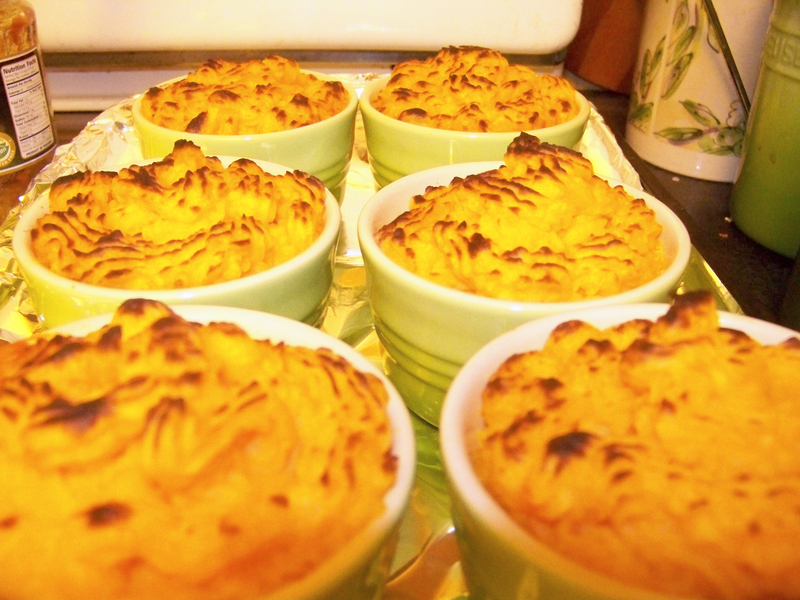 The simple thing to do would have been to spoon the mashed yam-and-potato mixture on top, fluffing it with a fork to create those peaks that would brown underneath the broiler (about 8 minutes, and rotate the tray at 4 minutes). 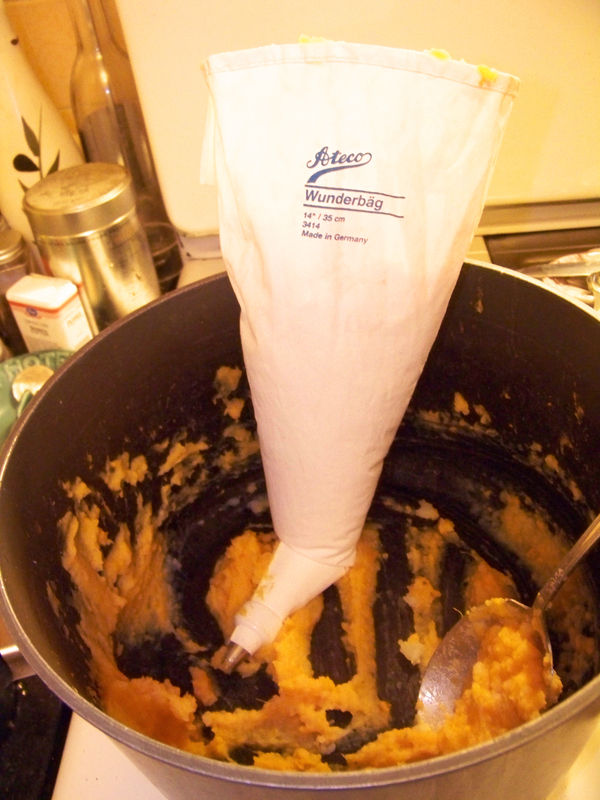 Instead, I pulled out a pastry bag and a star tip, and piped the potatoes in over the guvetch. Totally unnecessary, totally fun. If you decide to do it that way, work in a circular motion from the edge toward the center, finishing with a little peak on top. Piped, but not yet piping hot. 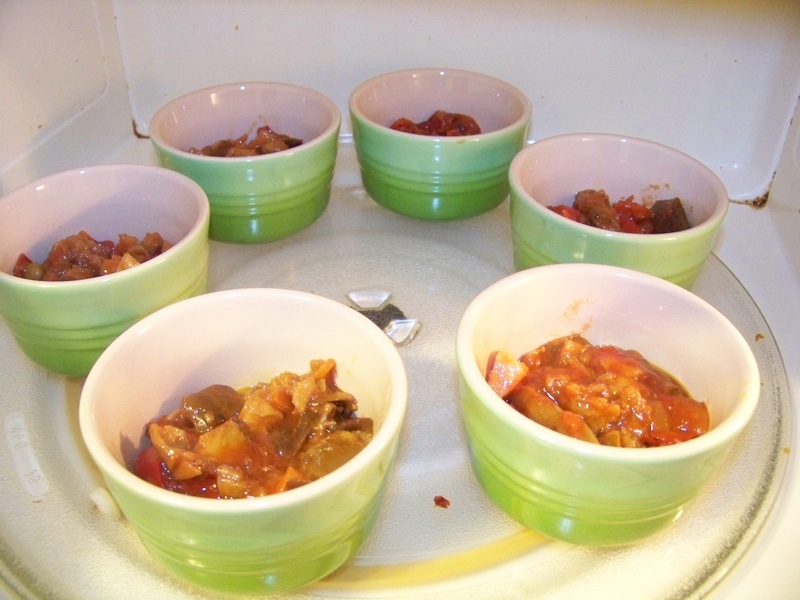 Place the ramekins on a foil-lined baking sheet. Eight minutes under the broiler (or you can use a kitchen torch, if you wanna get fancy about it). Rotate the pan at four minutes, and have a care, because some broilers are more efficient than the one in my sixty-year-old O’Keefe & Merritt. Good to go, after they’ve cooled a tad. Allow the ramekins to cool sufficiently that you can handle them — albeit gingerly — with your bare hands. Serve while warm. Makes six.